Our commitment to building solid, lasting relationships is evident in our continued success. We strive to develop business relationships based on respect, trust, and honesty. This is what we firmly believe sets us apart from other companies and what has provided us with a list of distinguished past customers. With every project we work on, our goal is to have a final product that our customer, community, and company are all proud to be a part of. Our expertise and experience has grown to all facets of construction. Our rich history was built around commercial projects, primarily through the use of pre-engineered steel buildings. Throughout the years, we have used steel buildings in a wide array of applications. Today we are a full-service Design-Build company that can handle any of your contracting needs. We create a building that works for you by combining creative design capabilities with quality products in masonry, concrete, wood, or steel. We take our customers’ visions and turn them into reality. From concept to completion, Systems West has the knowledge and experience to make the entire process enjoyable and worry-free. We look forward to helping you with your next construction project! Since the 1960s, there has been one common thread to the success of Systems West: our people. Construction is our passion. Quality is our obsession. Your project team will be comprised of an experienced collection of designers, business developers, architects, project managers, craftsmen, and engineers. Your team will be committed to completing your project on budget and on time with the perfect blend of functionality, feasibility, and aesthetics. Systems West is comprised of specialists within the construction industry, all with years of experience. Throughout the years, we have continued to gain knowledge to better serve our clients. Our employees have proven track records and the backgrounds to manage a project from implementation to completion, no matter what market you are in. From our administrative assistant to our laborers, our people know the business, which in turn makes your project more stress-free and enjoyable. In fact, we have employees that have been with us for over 25 years. We’ve had the opportunity to work with thousands of people throughout the industry and have cultivated ties with the best. No matter who is on a Systems West project, you can rest assured they are experienced and professional. Most importantly, they understand our company's focus on quality and service, which is what our clients will receive. Surprises are the result of poor communication. If changes are requested, we quickly present pricing and economical solutions to you in writing. We understand that communication is key to having a successful project, and we pledge to keep you completely informed each step of the way. When you select Systems West, you’re getting more than a contractor; you’re getting experienced crews, time-tested subcontractors, and our promise to be there even after the warranty. 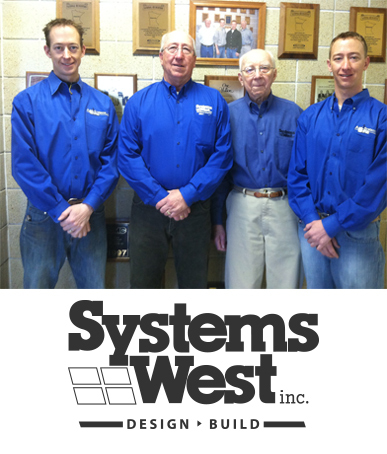 As mentioned, Systems West’s most valuable assets are our employees. This is why we make safety our number one priority. We continually strive to make our work environment and job sites clean, safe, and accident-free. We hold weekly safety meetings with all employees and subcontractor foremen. We adhere to a strict personal protective equipment (PPE) policy, the AWAIR Safety program, and a workplace accident and injury reduction act compliance program. Although we are often asked this question, it is difficult to give a simple explanation. Below are several important reasons we have heard from our past clients. Which is most important to you? Local Contractor: Since 1967, we have offered decades of continuing construction services to Central Minnesota and its surrounding areas. We will be here to take care of you in the future. Single Source: We believe it is possible to build projects without a lot of problems and are committed to keeping your project problem-free. With single source responsibility, each aspect of your project will be handled through us, which streamlines communication and efficiency. Synergy: We are totally committed to the team approach between owner, architect, and contractor to successfully complete a construction project. Quality: We build facilities in our local communities that both our clients and company are proud of. Reputation: Being local, we have an inherent desire to keep the customer/client happy by building on time and on budget with not only the project at hand but also future projects and relationships. Our reputation is of utmost importance to us. Relationships: We have proven relationships with both designers and subcontractors, and we started many of these partnerships over 25 years ago. Our specific knowledge of workmanship and capabilities of local and surrounding area subcontractor’s insures a better job for you. Employees: Our corporate culture is based on exceeding our clients’ expectations while taking care of our employees. Our quality employees are the common thread to our continuing success. In-House Capabilities: In today’s construction world, many “construction companies” don’t have any craftsman or construction equipment at all. Systems West does. We have all the people, equipment, and knowledge to handle every facet of construction. Safety: Systems West, Inc. strives to make our job sites and work environments clean, safe, and accident-free. From our employees to our subcontractors, our team is committed to assuring safe work practices and following our strict safety policies. Cost: With our years of experience, continual learning, and the use of the latest construction technologies, your project will be completed to the highest quality and in the most cost-effective manner.